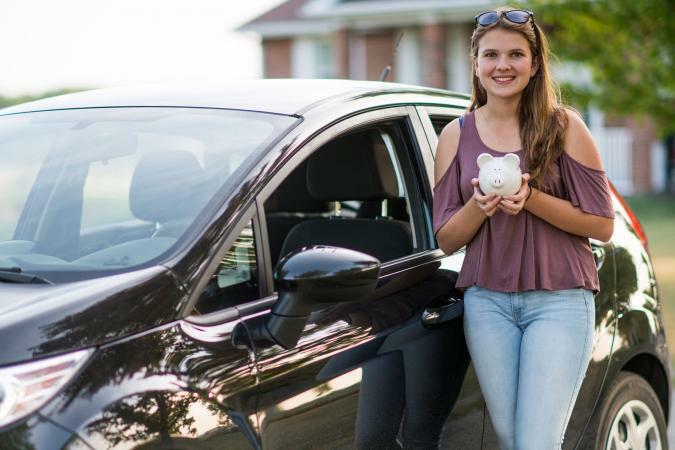 Saving up to buy your first car can be exciting and challenging. Look for ways to keep your savings out of sight and out of mind so it will still be available when you want it most. Setting a savings goal is vital to making your first major purchase. Once you know how much money you'll need, you can start figuring out how to get it. The average cost of a new car is just over $36,000 while the average for a used car is about $19,000. When you look at what experts say are the best used cars for teens, most start around $5,000. Jump on a trusted website like Kelley Blue Book and start searching new or used cars to see how much different ones sell for. If you search by cost, you'll get a good idea of what kinds of vehicles are most likely to fit into your budget. If you're more of a hands-on learner, head out to some car dealerships and browse the lot. Some part-time jobs for teens pay more for your time than others. Federal minimum wage is $7.25 per hour, but each state can set a different minimum wage. Making the most money in the least amount of time helps you reach your goal the fastest. Consider adding odd jobs to your work load to increase earnings from time to time. Start planning a few years before you're old enough to drive so you can calculate how long it will take you to save. Stashing money over a longer period gives you more funds, but also means you don't have to work yourself to the bone. Once you know about how much you need to save and about how much you can make each year, write it down. Having a plan helps keep you on track and focused. As your job status changes, you can adjust the plan to match. There are tons of ways to save money and each works best for different types of people. Think about your own spending or saving habits and how you handle wants versus needs. Then choose a savings strategy that plays to your strengths and minimizes your weaknesses. If you have a hard time keeping spending low, put your savings where you can't access it. Ask your parents put it somewhere and keep the location a secret. Open an online savings account so it's a little more difficult to withdraw the funds. Keep it at a trusted family member's house so it's not within reach. Looking at your own progress can help keep you motivated over time. Create a thermometer graphic on poster board with lines for your projected weekly or monthly savings. Color in the chart as you save to visualize your progress and your end goal. If your family is willing to help you out, leave a change collection jar in a common area at home. Parents, siblings, guests, and friends can drop change in anytime they like. It won't be a quick way to save, but over time this money can really add up. Think about who in your life would be most willing or able to financially help you buy that first car. Ask if they'd be willing to match your total savings over a specific period or at least a portion of it. If they can only agree to a portion, ask another family member to match too. Make up a quick family contract with details about the amount you are required to earn, the time frame for saving, and the amount your family will contribute. If you have your heart set on a specific new car and can save a significant amount of money, you should consider checking out options from that particular car company. For example, using the BoostUp app allows you to get a savings match of up to $500 to apply to a Hyundai car. Other companies may have limited time offers or even registries you can sign up for on their website, so be sure to check periodically to see what is available. You'll need to follow all rules and may have a limited number of vehicles you can purchase. In today's world almost anything can be funded through online crowdfunding campaigns. If you or your family are experiencing personal or financial hardship, use a website that allows personal campaigns to state your cause and invite investors of all kinds to donate to your project. Keep in mind many of these sites have strict guidelines and take commissions from your project. Be aware, however, that people who choose this route may face online backlash for requesting donations for purchasing items like cars. It's possible your campaign will get attention, but it may not be positive, helpful, or kind. Don't create an account or start a campaign until you've discussed the idea with your parents and considered possible long-term ramifications. When you buy your own car, you're more likely to take great care of it. No matter where you live or what your circumstances are, you can find ways to save up for that big first purchase.